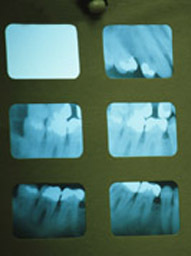 Sometimes, the dentist will tell you that he needs to take "X-rays" of your mouth. This involves putting little pieces of cardboard in your mouth, which you bite down on. The dentist's assistant usually does this while you're waiting for the dentist to come back. While you're biting down on the paper, the assistant goes to another room to push the button on a big camera next to your mouth. The camera takes a picture using very powerful light called "X-rays." This light allows the camera to see inside your mouth as if your cheek wasn't even there.